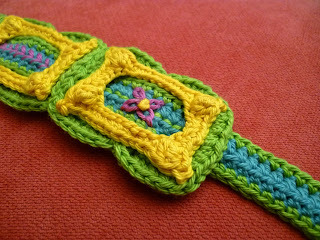 I love the idea of using a pattern more than once, but I don't really like to make the same thing twice! 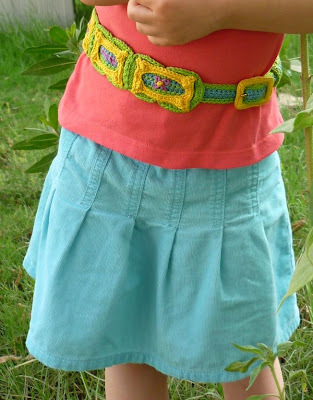 My daughter loved the "Genevieve's Belt" I designed for Interweave Crochet's special Accessories issue last year, so I decided to create a girl's version based on the same pattern. 1. Changed to a finer yarn; "Catania" by Schachenmayr nomotta, which is a sport weight (12 wpi), vs. the dk weight (11 wpi) that was used for the original version, and went down to a size B/1 (2.25mm) hook. The result was perfectly scaled down motifs! 2. 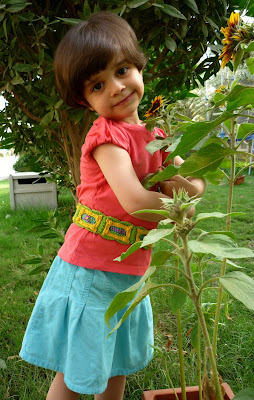 Shortened the Belt Strip to my daughter's waist measurement plus 4 1/2", and made fewer Frames. The strip of joined Frames is approximately 1/2 of the length of the belt strip. 3. Eliminated the surface crochet down the center of the Belt Strip. 4. 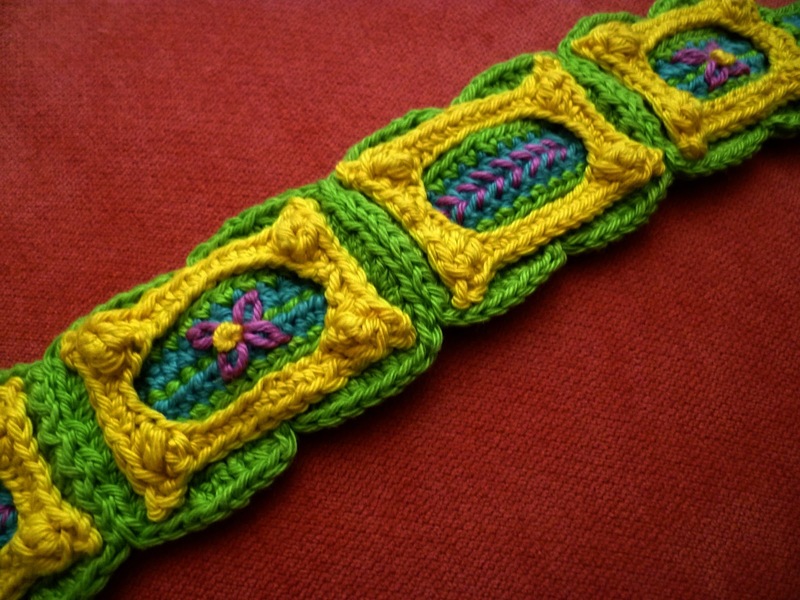 After the Belt Strip was woven through the frames, I embroidered lazy daisies and a chevron pattern on the Belt strip inside the frames, and eliminated the detail between the frames. I believe this project was a success because my daughter told me she wants to wear it every day, and I am thrilled because I was able to use an existing pattern again in a new way! Love the way that you've explained the changes. Definitely helps the rest of us in choosing how to refine and rework our own designs. 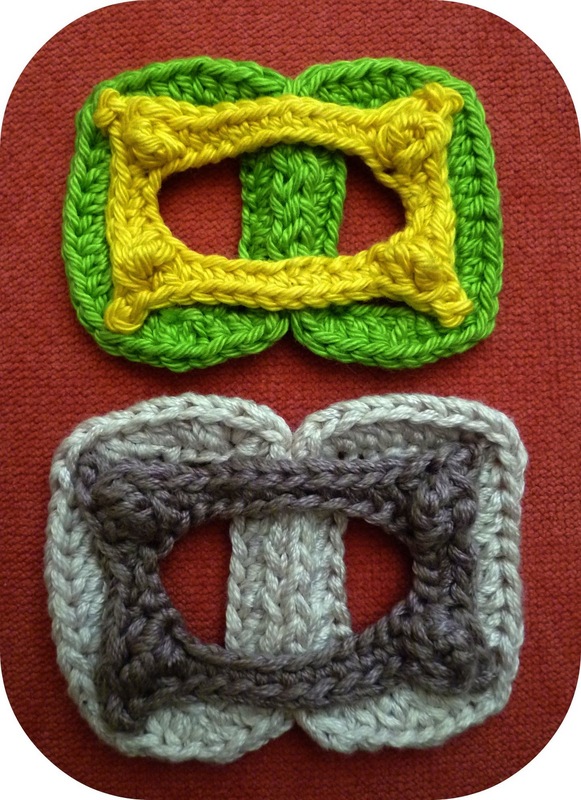 Thank you, CrochetBlogger, I am happy the instructions are helpful!